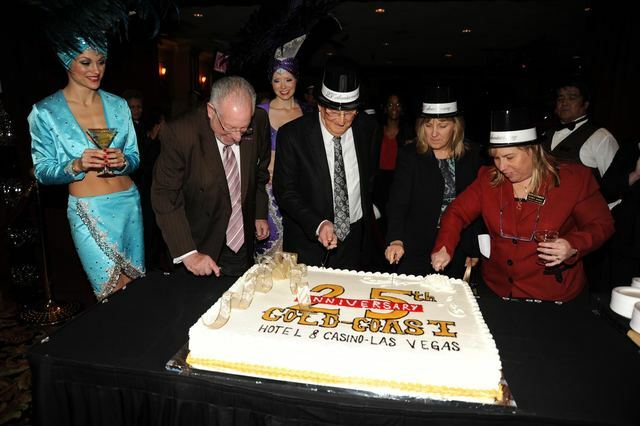 COURTESY From left, former Mayor Oscar Goodman and Boyd Gaming Executive Chairman Bill Boyd, cut a birthday cake in commemoration of the 25th Anniversary of the Gold Coast in December, 2011. Festivities marking the property's 30th anniversary are set for Dec. 20. 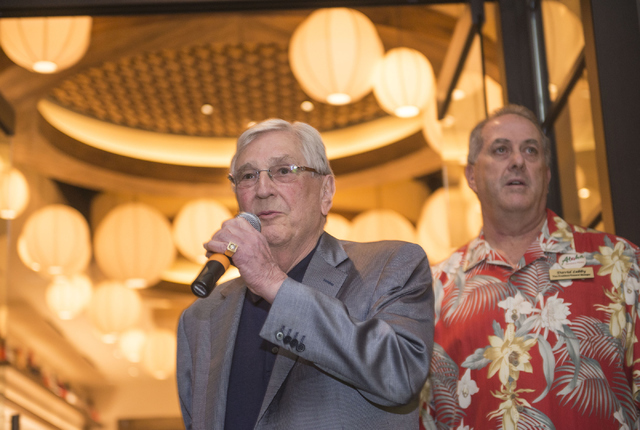 Jacob Kepler/Las Vegas Business Press Bill Boyd, executive chairman of Boyd Gaming, speaks with employees during the 2015 grand opening of the California Noodle House. The downtown California hotel-casino caters to Hawaiians. It was a cool, bright Sunday morning in Las Vegas. Americans were first hearing news of the fatal hate crime assaults committed in New York’s Howard Beach neighborhood one day earlier. “The Way It Is” by Bruce Hornsby and The Range topped the pop charts. Quarterback Bernie Kosar was taking the field to lead the Cleveland Browns to a 47-17 victory over the San Diego Chargers that would secure the AFC’s top seed going into the NFL playoffs. And Gold Coast opened for business. That was Dec. 21, 1986. The hotel-casino is celebrating its 30th anniversary jointly with The Orleans, which marks 20 years of existence. Both properties — part of the Boyd Gaming Corp. stable since the 2004 purchase of Coast properties from Michael Gaughan — will host champagne and cake public celebrations Dec. 20, and will feature buffet and drink specials and cash giveaways through Dec. 24. Gold Coast was the first local customer-based casino situated in the western side of Las Vegas, and according to Taeubel, marketing off-Strip properties has proven to be a continual challenge. Local customers represent about 75 percent of Gold Coast business, and about half at The Orleans. Taeubel said the two properties tend to be marketed together, although they feature significant clientele differences. The industry trend toward nongaming amenities has been a driving factor in the properties’ evolutions in recent years. Although trends have moved toward a focus on the peripheral offerings to customers, he said gaming remains solidly the heart of the industry. Another key to success for local customer-based casinos is the ability to build guest loyalty and maintain it in an environment that regularly increases gaming and other entertainment options. 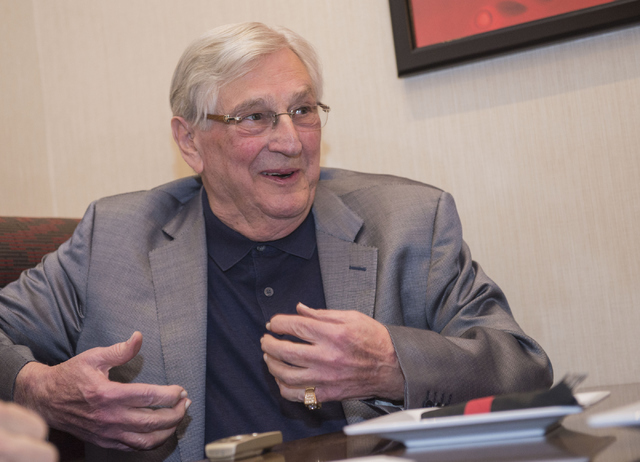 “Anytime a new casino opens up, I think there is still a time frame when customers go check it out, but they usually make their way back to you,” Taeubel said. “For a lot of different reasons. They are comfortable. They have built relationships. So for any new casino to benefit, they have got to cultivate different streams of customers. They can’t rely on locals right around their property like maybe the new Lucky Dragon (a 203-room hotel-casino on Las Vegas Boulevard and Sahara Avenue that opened in late November) might. Boyd Gaming owns 10 properties in the valley and 22 nationwide. The industry was heavily impacted after the onset of the December 2007 recession, but Taeubel points to strong customer-casino bonds as one reason Gold Coast and The Orleans fared relatively well. “We relied a lot on our good customers that came out of California and Texas, customers that we brought over from the Stardust (which the company closed in 2006),” he said. “And also, our Hawaiian customers kept pretty much the same pace. We did not lose a lot from some of those guest segments. And, during that time we still had our local customers. Both casinos are also among the six local properties participating this month in Boyd Gaming’s “Tree of Hope” charity contest. The company event, which began at a Vinton, Louisiana, property in 2007 and spread to Southern Nevada last year, is a Christmas Tree decoration contest voted on by members of the public. Boyd’s “Tree of Hope” donations — which totaled more than $25,000 in 2015 — benefit a range of local nonprofit organizations. The Orleans Dec. 20 anniversary celebration begins at 1 p.m., followed by Gold Coast festivities at 3 p.m.